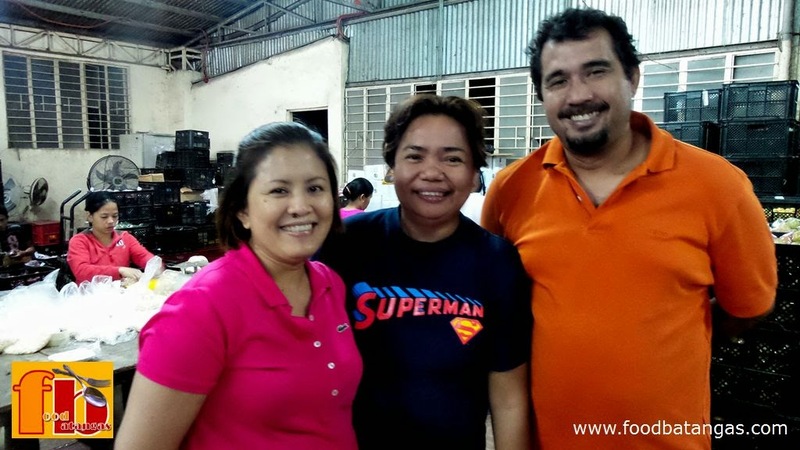 BCA owner Joy Tenorio-Villanueva with Dyna Dimaculangan-Aguda and visiting high school classmate Roland Samaniego. Food Batangas was fortunate enough to have been allowed to observe the packing operations of BCA, a food redistribution company based in the Municipality of Alitagtag in Batangas. 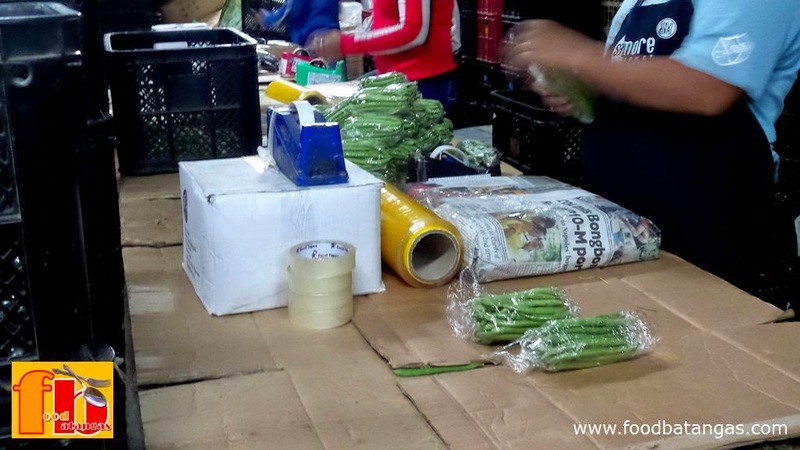 The company is owned by Jocelyn Tenorio-Villanueva with her husband Anthony and supplies fresh vegetables, fruits and herbs to malls and standalone supermarkets in the CALABARZON region. BCA was the brainchild of Jocelyn, known as ‘Joy’ to her friends. Husband Anthony already had a farm and was supplying eggs to Baguio City back in 1995. Rising fuel costs, however, threatened the viability of continuing to truck eggs to the country’s summer capital. It was then that Joy, who despite being a Behavioral Science graduate displayed outstanding business savvy, decided to make optimal use of the trucking expenses and had vegetables shipped back to Southern Tagalog in the return trips for distribution in the area. Although the first four years of operations for BCA had many challenges, Joy persevered and was eventually rewarded for her efforts when she landed a deal to supply the vegetable section of one of the country’s largest mall chains. If anything, Joy persevered even more to earn the mall’s trust and respect. She did this by not only being punctual with distribution targets but also by knowing when to say no to offers of new sites when she was not one hundred per cent certain that her company could meet distribution requirements. 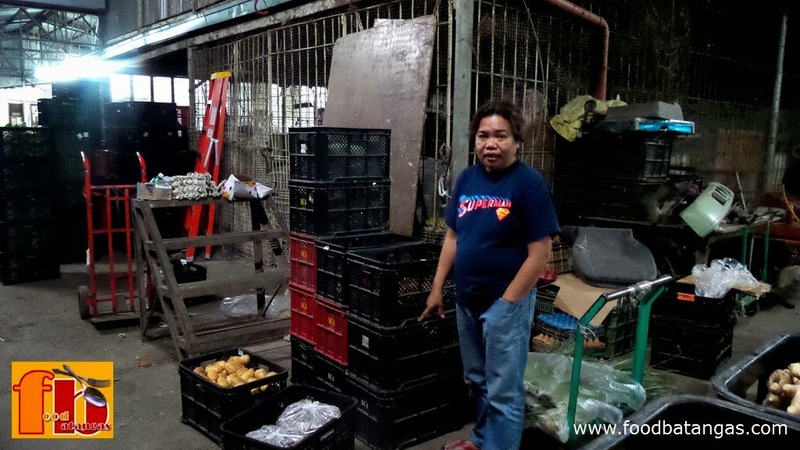 Dyna Dimaculangan-Aguda giving Food Batangas a tour of the warehouse. Joy works closely with high school classmate and neighbor Dyna Dimaculangan-Aguda, an Electronics and Communications Engineer who decided to come home after seven years of living abroad. Dyna supervises operations at the repacking warehouse in Alitagtag. She was the one who received us during our visit and gave us a comprehensive tour of operations at the warehouse. Seventy per cent of the vegetables, she said, were brought in from Baguio. The rest was purchased from farms in Batangas, even products that one traditionally associates with the Mountain Province such as Baguio beans and cucumber. Cucumbers being repacked for distribution. 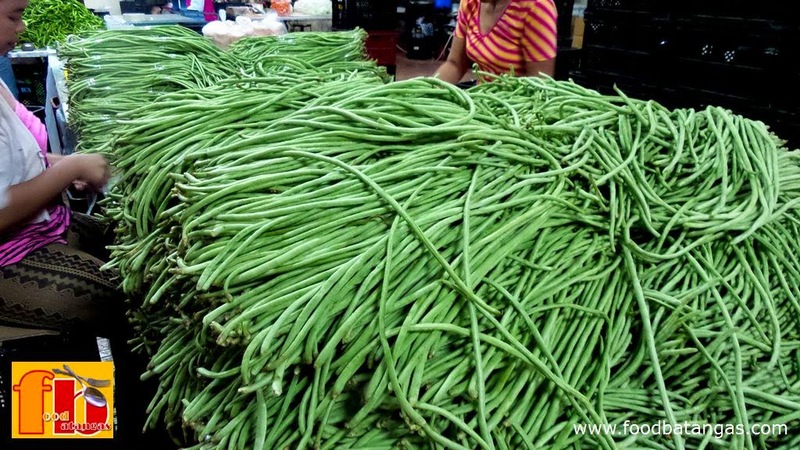 These "Baguio" beans, we were told, were in fact grown right in Alitagtag. In fact, Dyna told Food Batangas, many farmers from within the community have begun to bring their produce to BCA, which therefore helps the neighborhood economy. Moreover, because BCA cleans, weighs and repacks produce before these are brought to malls and supermarkets, it has also provided jobs to locals. “Name any vegetable,” Dyna said, “and in most likelihood you will find it here.” Daytime operations at the warehouse are dedicated to cleaning produce. Nighttime operations, which we were able to observe first hand, are for weighing and repacking. Name any vegetables... Like this mound of string beans. 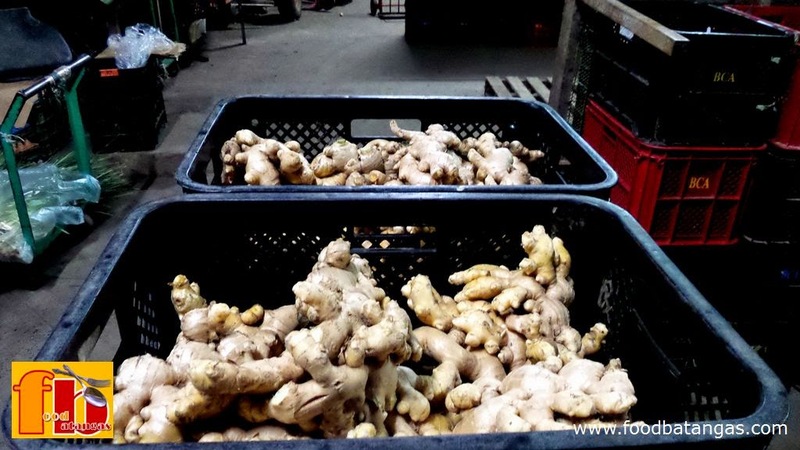 How about these Taiwan ginger, waiting to be repacked. BCA also imports fruits and supplies these to the malls and supermarkets, especially during the holiday seasons. During our visit, we were able to observe mostly local produce being repacked. The trucks from Baguio, Dyna told us, were due later in the night; and when they started arriving, that was when activity at the warehouse would hit fever pitch. 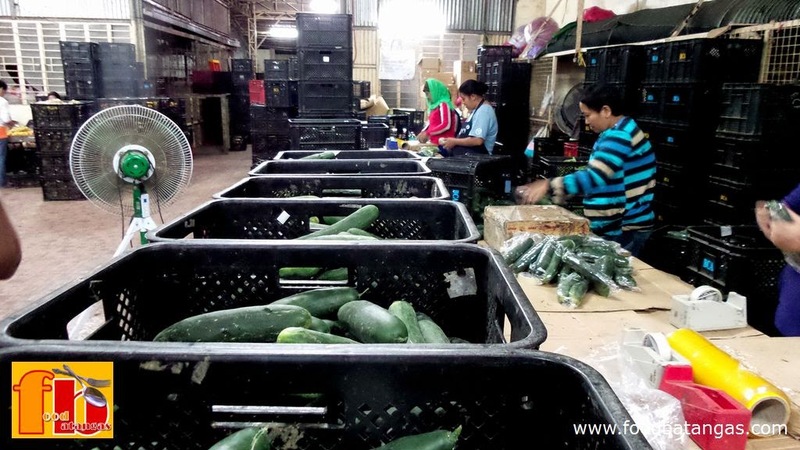 By the wee hours of the morning, the packed vegetables would be laden into BCA’s trucks, which would then begin leaving one by one headed for various destinations around the CALABARZON, one in most likelihood right in your own neighborhood. For all you know, the crisp romaine that you munch on the next time you toss a salad may be one that came to your table because of the vision of one lovely housewife with a knack for business.